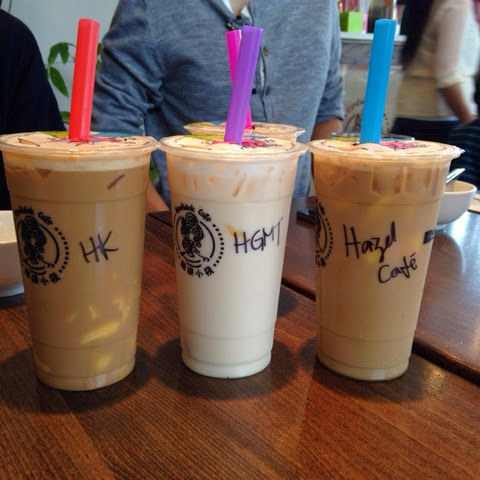 First off, you got to have bubble tea! I had the Honey Green Milk Tea with pudding (instead of tapioca since I don't care for it that much) and holy crap this was so good! I usually love honey flavored anything and tend to get black milk tea over green milk tea, but I'm glad I got the green milk tea version since it is lighter and you can really taste the honey in it. We also ordered quite a bit of appetizer things. 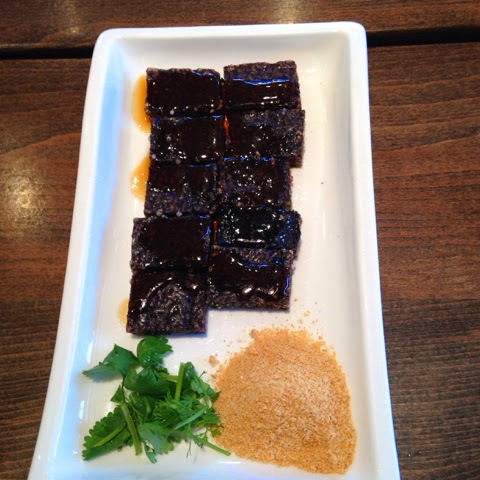 This one below is the pork blood rice cakes. Yes, this may sound gross to some, but seriously, this was good. 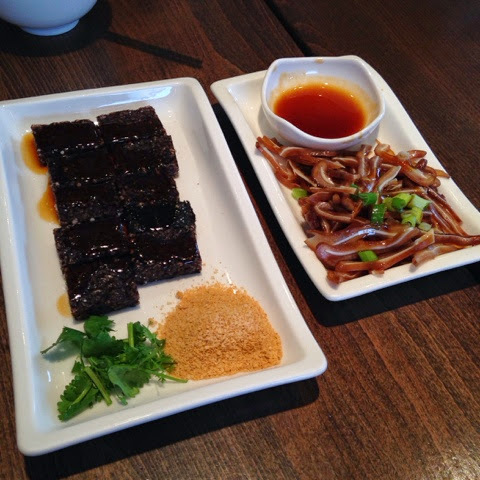 It reminds me of the Korean pork blood sausage that is filled with rice as well. 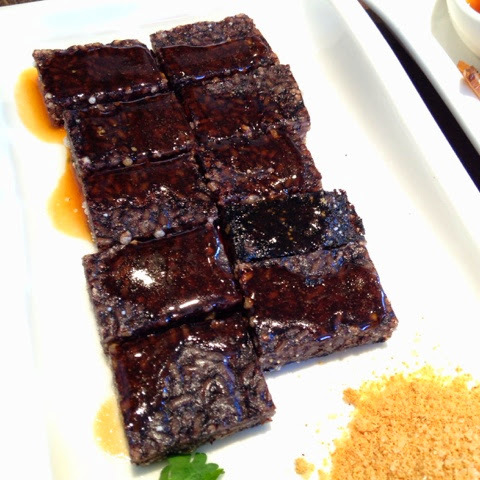 This one was actually a bunch of rice in a pork blood stew and then cut into little rice cake squares. The sauce on top was sweet and when dipped with the ground peanuts it made for a nice treat. 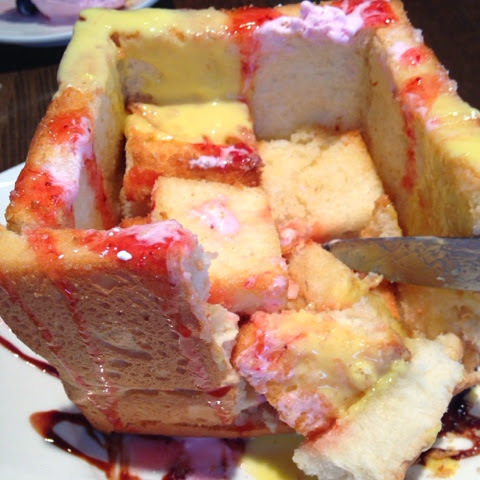 I couldn't eat too much of it since it was a little sweeter than I would have liked it to be, but it was still good. You can see that this is mainly rice and what holds it together like the glue is the pork blood sauce. 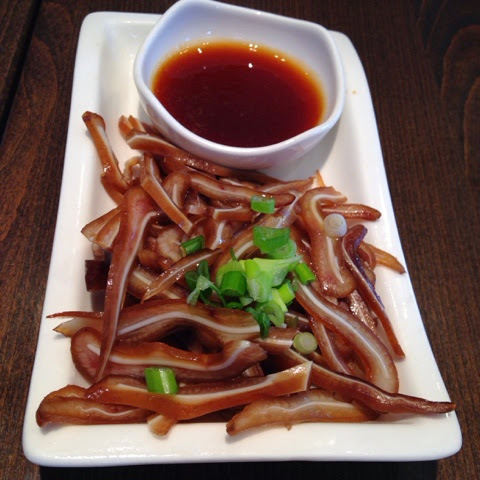 Another little snack that is one of my favorites is stewed chopped pork ears. The cartilage is nice and crunchy on the ear and the flavor is really simple. I really like the texture of this, but I know it doesn't math everyone's tastes. We poured a little of the sweet/savory sauce over it and enjoyed nibbling on this. 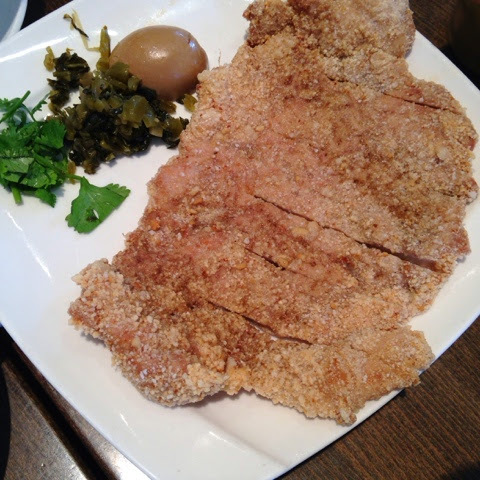 My cousin, who is a really big fan of tonkatsu (the breaded and fried Japanese pork dish) wanted to try this Taiwanese style one and it was pretty good! There wasn't any sauce, but it wasn't really needed since the breading was flavorful enough on its own and the pork wasn't dry. I believe they pounded it out to be thinner and more tender. Ah, on to my dish! This was so good! 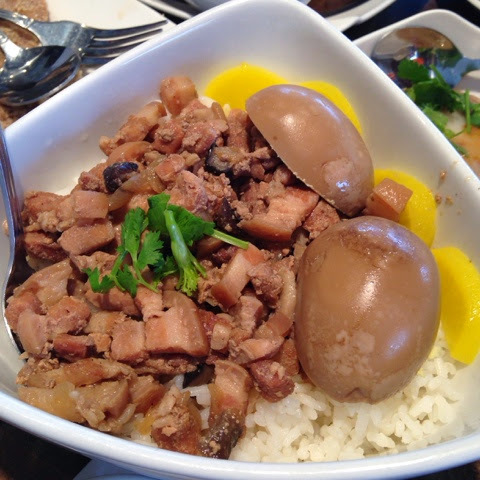 If you are a fan of braised pork and pork hock, you would absolutely love this dish. It came with a bowl of noodle soup which was very clean tasting and a real palette cleanser. 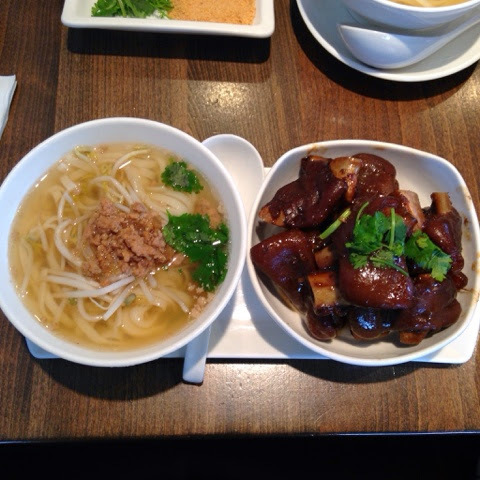 The pork hock was nice and tender, but not too done where it would be too slimy/mushy. I definitely had leftovers and took some of this deliciousness home! When we saw that they had the Xiao Long Bao (literally translated as little dragon bun/dumplings), I knew I had to try them. 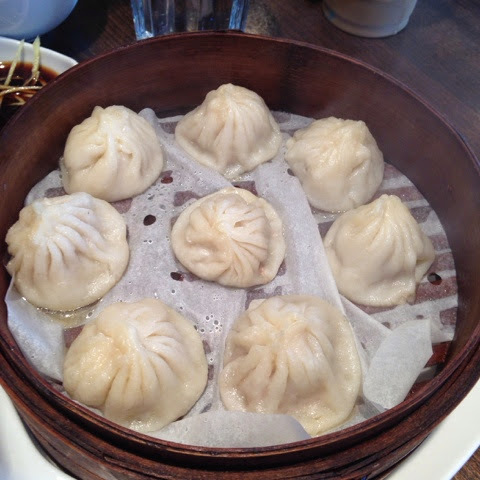 These are my favorite types of dumplings since they have the soup inside (if done right and the outside wrapping doesn't break!). I have to say this one wasn't as good as I would hope it to be and I probably wouldn't order it again since I've had better dumplings in other restaurants. For the price though, this isn't bad, and is good to share amongst 2 people for a quick snack. 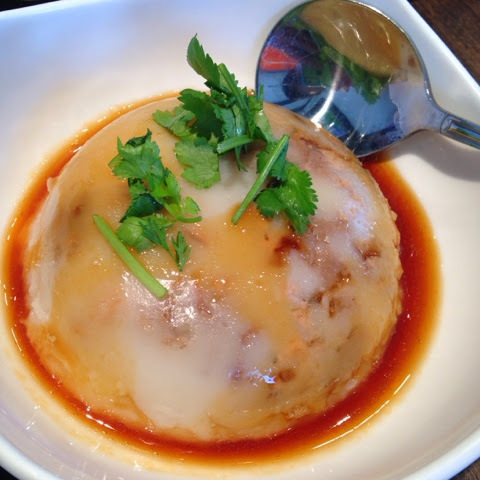 Next, we had this turnip cake pudding type thing and again, this wasn't as good as I was hoping it to be. The flavor was there, but the texture was a little too soft for my liking. Also, I found the use of that same sweet/savory sauce to be a bit too powerful for this dish. A simpler soy sauce or something would have been better, or even nothing at all. Just having the sauce on the side instead of poured over would have been better. My brother wanted the pork over rice dish. I took a bite or two and it was pretty good--it is definitely filling. I really liked the steeped hard boiled eggs on top along with the pickled radish (takuan). And now, THE BEST PART! 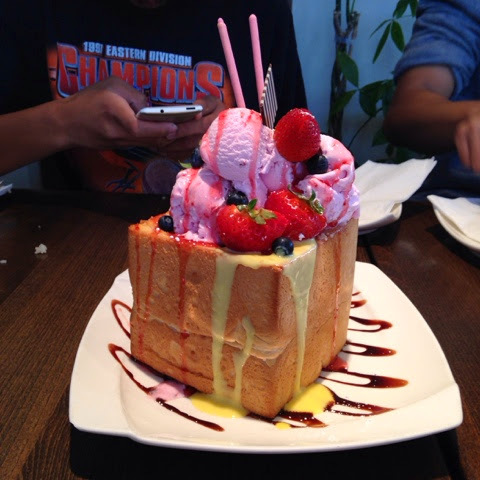 CAN WE PLEASE LOOK AND APPRECIATE THE BEAUTY OF THIS DESSERT!?!?! 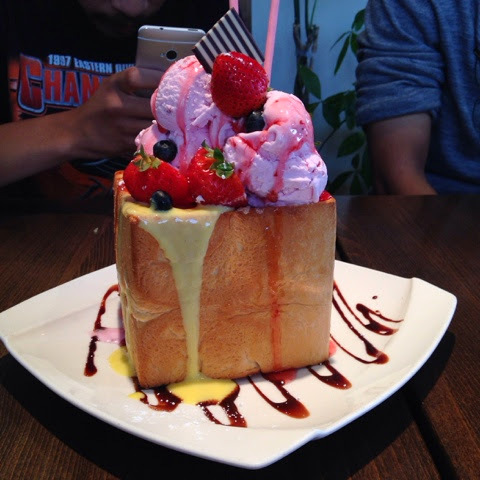 This was the strawberry custard honey toast (more like strawberry ice cram). 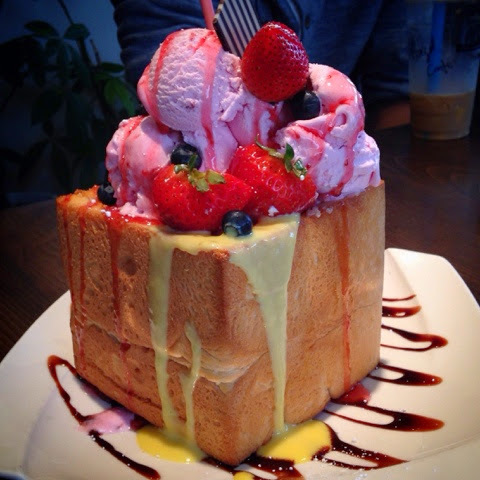 These type of sweetened breads/toast are really popular in Asia and in many Hong Kong and Taiwanese styled restaurants. 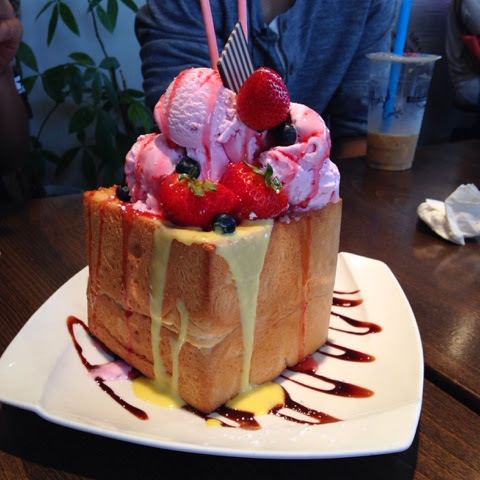 They loaded the dish with fresh strawberries, tons of ice creams, and some blueberries and a couple of strawberry Pocky sticks as garnish. Inside, the bread is actually squared out to bite sized pieces and each piece is coated with the most delicious butter & honey blend and toasted to perfection. UGHHH! I'm craving it again! They have other flavors that I for sure want to try next time I'm there! 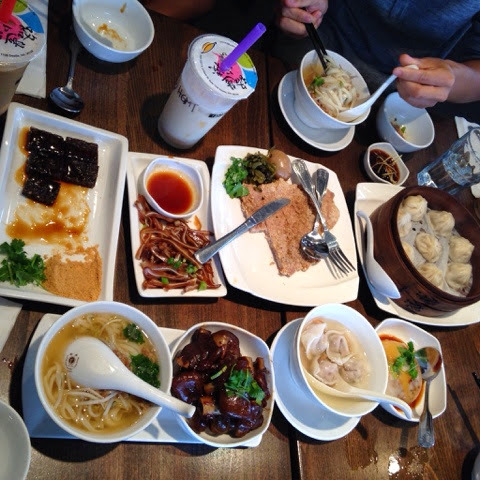 Have you tried any Taiwanese food? What is your favorite? 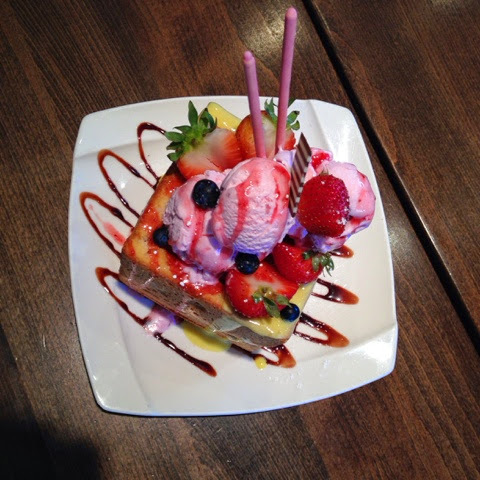 Have you seen a dessert like this before?! OMG I love Taiwanese food! It's so hard to find a good place that makes it well. Also, I'm such a bona addict, it's not even funny. Haha.